CatTools is a network configuration management solution that automates vital tasks, network change and configuration tasks. CatTools is designed by network engineers, for network engineers. We understand how you work and the tasks you need to perform. CatTools is here to make your life easier. It does this by scheduling batch jobs, automating changes and reporting on the things that matter to you as a network engineer. Plus, CatTools is very affordable. Start protecting your network today! Hello, my name is Mark Allen, and today I'd like to walk you through the top 3 features of SolarWinds Kiwi CatTools. Kiwi CatTools runs on most modern Windows operating systems. You can install it as a stand-alone application or as a service. Installing it as a service grants you the ability to schedule automated backups or config changes while you're away from your computer. At the heart of CatTools is a batch processing machine. Once you've set up your network devices, your routers, switches, and firewalls, you then instruct CatTools to perform any one of the many predefined activities against those devices. Some of the activities include sending commands directly to your device in normal or privilege mode, setting the password for your devices either one by one or en masse, testing connectivity, and backing up and restoring your running configurations. The first feature of Kiwi CatTools is the ability to mass backup the configuration of your devices. You can even have any differences automatically emailed to you. Let's quickly add a device. Configure it's IP address and choose what type of device it is. Next, we'll assign saved credentials to this particular device so you don't have to re-enter them later. Now, we'll create an activity to back up this device or multiple devices and to have the activity do the job for us. First, we'll select the activity type. Now you can choose the time of day this backup job should run, either reoccurring or scheduled. You can select all devices or explicit devices that should be run. 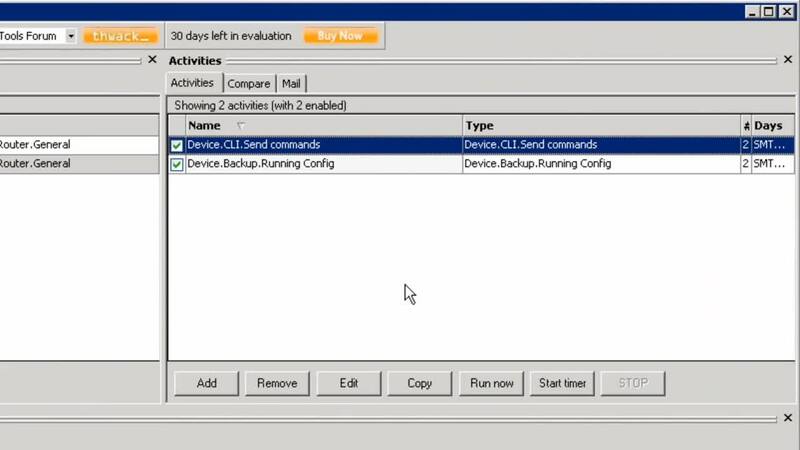 You can have the job send an email upon completion, and you can configure several options for the job including the location the config file should be saved to. Let's run the job now. Another excellent feature includes using activities to issue commands via telnet or SSH to many devices at once. You can also change the configuration of devices at scheduled times. A great example is to get the version of IOS you're running across multiple devices. Here we have a job that sends CLI commands. This is a default type that ships with the product. You would simply select Device, CLI, Send Commands. You can change the time period. You can also select which devices this job should be run against. You can configure your email options, and in the Options tab, you can type in the command that you would like to run. In this example, we are doing a "sho ver" for show version. We can see that the command output is going to be saved to this file location. Let's run this command and see the results. You can also directly compare two previous configuration backups right from within the tool. I'll come over here to the Compare tab and select two different configuration files. And as you can tell, the tool highlights differences for me with changes in red and additions in green. The third great feature is our reporting activities. For example, if I wanted to get the ARP table from a device, I'd simply open this window, select report, ARP table. Choose one or more devices. Let's go ahead and run it now. Then we can view the report either in text or HTML format. The HTML report is a nicely formatted table that is very easy to read. As you can see, with SolarWinds Kiwi CatTools, you can automatically back up the running configuration for your entire network. With Activities, you can issue any command via telnet or SSH to collect information on all your devices, update a password, or make a change to your network. And finally, our Reports feature will put the info you need right at your fingertips. I'm Mark Allen, and thanks for taking a look at the top 3 features of Kiwi CatTools from SolarWinds.